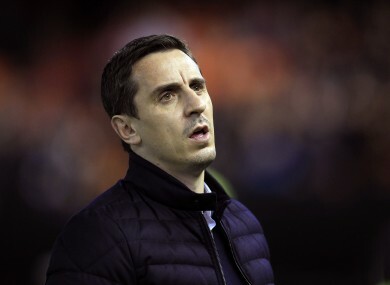 GARY NEVILLE’S UNHAPPY tenure at Valencia was brought to a sudden halt on Wednesday as the Spanish club announced he had been sacked after just four months in charge. Neville’s first foray into senior management after limited experience as an assistant to Roy Hodgson with England was a risky one from the day the shock announcement of his appointment was made in early December. On the back of a hugely successful 20-year playing career with Manchester United, Neville had gained widespread praise for his astute analysis as a Sky Sports pundit in his homeland before taking up the challenge offered by Valencia’s Singaporean owner, his business partner and friend Peter Lim. The hiring of an untried coach who didn’t speak Spanish and the close personal relationship between Lim and Neville raised suspicions straight away in Valencia. I would question it as a neutral observer,” Neville said himself on the day he was presented as the club’s new coach. Ultimately, he didn’t win enough even to see out his short-term contract until the end of the season. I would have liked to have continued the work I started but understand that we are in a results business and in the 28 games (W10, D7, L11) they have not been to my standards or to those which are required by this club,” Neville said in a statement after his dismissal. Even those statistics are padded by three wins in Cup ties against third-tier Barakaldo and struggling Granada, as well as a 10-0 aggregate rout of Rapid Vienna in the Europa League. Neville won just three of 16 La Liga games in charge to see Los Che tumble from four points off the Champions League places when he arrived, to six points above the relegation zone with a tough final eight games of the season to come. Cup runs briefly prolonged his stay, yet even they ended in major disappointment. The 7-0 thrashing at the hands of Barcelona in the first leg of the Copa del Rey semi-final was described by sporting director Jesus Garcia Pitarch as one of the worst results in the club’s history. Elimination from the Europa League at the hands of a fellow La Liga side with far fewer resources in Athletic Bilbao earlier this month closed the door to any salvation for a miserable season at the Mestalla. Neville will be succeeded for the remainder of the season by Pako Ayestaran. The hiring of Rafael Benitez’s former assistant to translate Neville’s ideas to the squad in February coincided with Valencia’s only upturn in form in recent months. I’m the head coach of Valencia, I will be the head coach of Valencia for the rest of this season. If I leave, Pako will leave,” Neville said at the time of suggestions Ayestaran had been hired with eyes to replacing him. Neville’s trust in Ayestaran, his old friend Lim and his own ability to turn around a sinking ship in Spain was ultimately misplaced. Email “Neville's Valencia voyage of discovery doomed to fail”. Feedback on “Neville's Valencia voyage of discovery doomed to fail”.